The Sultan's Elephant heads down a crowded Haymarket in central London, on the third day of the presentation. The Little Giant's space capsule makes landfall in London at last. I don't know if it's coincidence, but Phileas Fogg sets off from just around the corner in Around The World In Eighty Days. La Petite Géante says goodbye to her dear friend the Sultan's Elephant. I know how she feels. I'll miss them both. You're very lucky this doesn't have a soundtrack, as her appearance was accompanied by the most dreadful jazz-rock I have heard in many a year. Thankfully it had picked up a little by the evening. The giant puppet girl wakes up on the third day of the Sultan's Elephant event in London. The wooden spaceship crashed into the tarmac of Waterloo Place in central London - part of Royal de Luxe's The Sultan's Elephant event. As the crowd dispersed, the people who'd been manning the movable cordons around the Girl and Elephant had their photoshoot. La Petite Géante stops to answer a call of nature. Being gentlemen, her assistants give her some privacy. I was driving home last night from training and had to take a diversion because the police had closed Vauxhall Bridge. When I drove past on the other side of the bridge I noticed that the diversion was being caused by the night-time moving of a 42 tonne mechanical elephant! You might have to click on the picture to see it, but there is a tiny little man in the front that is controlling things, and a couple on the back. It really is astonishingly big! Once upon a time, there lived a sultan who was tormented in his dreams by visions of a little girl who was travelling through time. This is his story, incredible but true. The sultan could no longer sleep, his growing anguish diverting his attention from affairs of state. In order to cure his sickness, and believing that he would find the girl in the land of dreams, he commissioned an unknown engineer living in 1900 to construct a time-travelling elephant. A few months later, the sultan set off with his court in search of the little giant, which, in the course of his nightmares, had been transformed into a marionette 5 metres high. The trip was awful, but they found a series of clues as to her wherabouts. The giant loved sewing - she liked to stitch cars to the tarmac, boats to quaysides, trains to railway tracks and sometimes even envelopes to letterboxes. The elephant followed the trail left by the puppeteers. And as in all love stories, strange things began to happen. Such was his happiness at getting closer to her, he began to expel hundreds of living birds which disappeared into the sky in a burst of joy. On the third day of The Sultan's Elephant presentation in central London, the little giant puppet knelt down in the Mall, in front of Admiralty Arch, allowing small children to swing on her arms. in London this moring. Whilst it was fascinating, it was too far away to get any good shots with my 20mm prime lens so here are pictures of the crowd instead. The Sultan's Elephant heads north up Marlborough Road - between St James's Palace and Marlborough House - away from St James's Park, on the third day of the presentation in London. 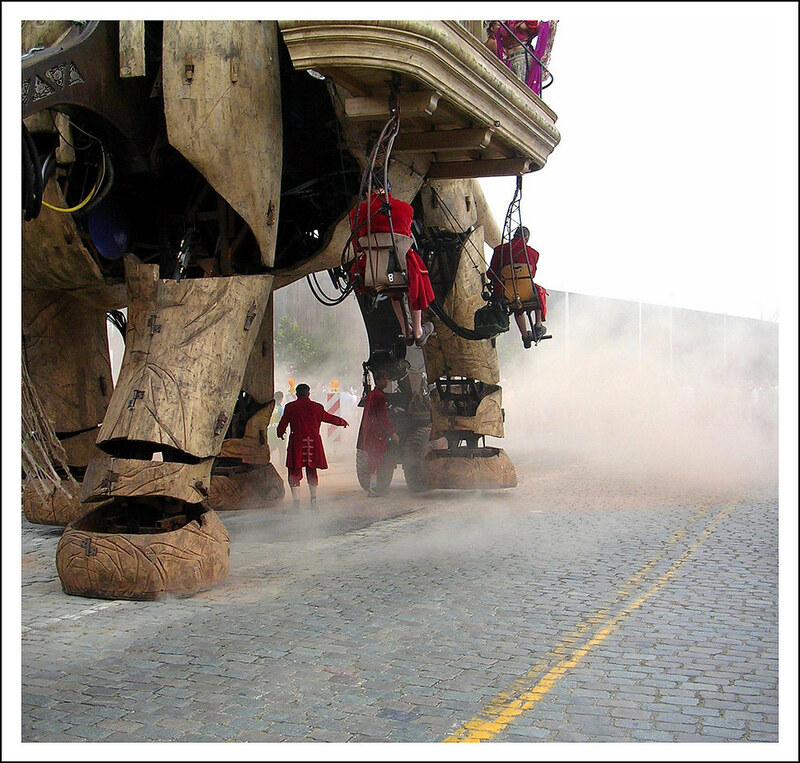 This is part of the Royal De Luxe four-day event : The Sultan's Elephant to be staged in various parts of London over the weekend. Many streets in Central London were closed to traffic during the Sultan's visit with his giant elephant - the whole area around Trafalgar Square and the Mall were pedestrianized whilst the massive wooden elephant and the giant little girl paraded through the streets. The giant puppet girl and the elephant face each other on the morning of the third day of the Sultan's Elephant events in central London. The girl is about to receive her morning shower from the elephant's trunk. The Sultan's magical time traveling elephant waits on Pall Mall. This mechanical creature captivates crowds. Passers-by stood amazed as smoke emerged from the point of impact. The rocket crashed nose-first into Waterloo Place on Thursday. "It looks like something from a Jules Verne novel," said Robert Goddard, 24, an engineering student. "It's well crafted." Black&white hand-made print toned in Sepia & Selenium. On the morning of the third day of The Sultan's Elephant in London, the giant puppet girl showered in water sprayed from the elephant's trunk.